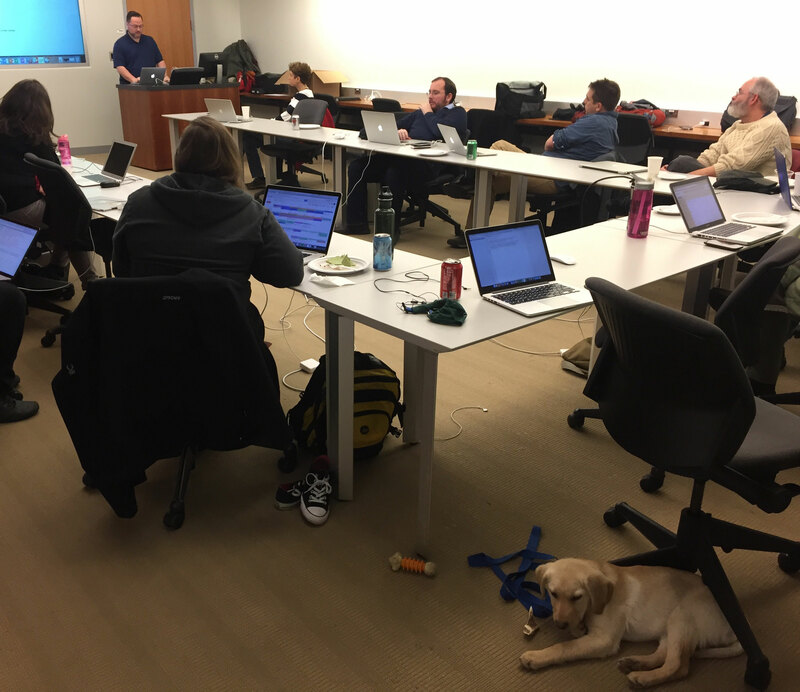 At Day 1 of Moodle Hack/Doc Fest we got down to work testing messaging and notification in Moodle 3.2, discussing CLAMP’s future approaches to documentation, reviewing H5P, and learning about changes to the Filtered Course list plugin. The group began testing messaging and notifications in Moodle 3.2. We determined that the new interface is cleaner than the old one, and the use of a red dot to indicate when there are updates for the user (e.g. notifications, messages) is more obvious in 3.2 than in previous versions of Moodle. We learned that notifications from Moodle activities require cron to be running, and likely running at the recommended once-per-minute rate to be useful. Several attendees huddled regarding CLAMP’s approach to documentation going forward and sense was that we want to move toward crafting documentation and scripts that could easily be used at CLAMP schools. This information could be written in Markdown and made available in some sort of online repository — e.g. github — but we haven’t determined the specifics yet. CLAMP would still contribute and update documentation on MoodleDocs as appropriate. The developers got together to discuss the future of CLAMP’s development server, which is currently a physical machine residing at one of the CLAMP institutions. Going forward we are going to look at moving the development instance to a cloud-based hosting solution which would free us from the need to maintain our own hardware. Jason Simms (Lafayette College) talks about H5P on Day 1 of Moodle Hack/Doc Fest. Hank, a Seeing Eye dog in training, attended the presentation. Credit: Ken Newquist. Over lunch Kevin Wiliarty (Hampshire College) did a presentation of Filtered Course List 3.0, which adds a lot of flexibility to the plugin, but adds a steeper learning curve for Moodle admins. After Kevin’s presentation, Jason Simms (Lafayette College) did a high-level rundown of H5P, which is an HTML5-based alternative to Flash that can be used to create rich web content such as videos, images, quizzes, charges, collages, documentation tools, finding the hot spot, guessing answers, etc. With the H5P plugin installed in Moodle, that content can then be embedded in courses. The HP5 website includes tutorials for content creators. Integrating Moodle 3.2 into the Moodle Liberal Arts Edition. Initial testing of the Boost theme in Moodle 3.2. Extending a Moodle-to-Banner grades extract tool.